Sforza (pronounced [ˈsfɔrtsa]) was a ruling family of Renaissance Italy, based in Milan. 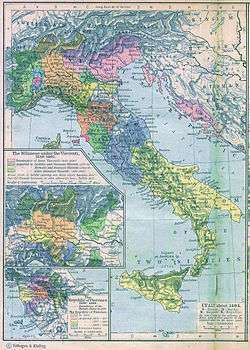 They acquired the Duchy of Milan from the previously ruling Visconti family in the mid-15th century, and lost it to the Spanish Habsburgs about a century later. Rising from rural nobility, the Sforzas became condottieri and used this military position to become rulers in Milan. The family governed by force, ruse, and power politics, similar to the Medici in Florence. Under their rule the city-state flourished and expanded. Muzio Attendolo (1369–1424), called Sforza (from sforzare, to exert or force), founded the dynasty. 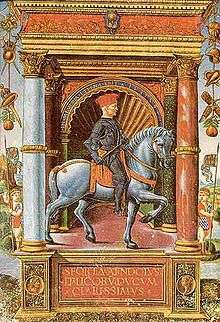 A condottiero from Romagna, he served the Angevin kings of Naples and became the most successful dynast of the condottieri. 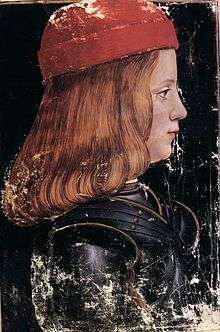 His son Francesco I Sforza ruled Milan, having acquired the title of Duke of Milan (1450-1466) after the extinction of the Visconti family in 1447. The family also held the seigniory of Pesaro, starting from Muzio Attendolo's second son, Alessandro (1409–1473). The Sforza held Pesaro until 1519, with the death of Galeazzo. Muzio's third son, Bosio (1411–1476), founded the branch of Santa Fiora, who held the title of count of Cotignola; the Sforza ruled the small county of Santa Fiora in southern Tuscany until 1624. Members of this family also held important ecclesiastical and political position in the Papal States, and moved to Rome in 1674, taking the name Sforza Cesarini. 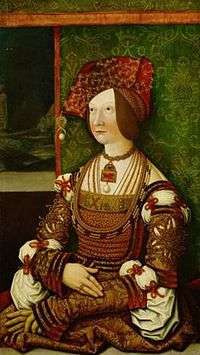 The Sforza became allied with the Borgia family through the arranged marriage (1493-1497) between Lucrezia Borgia and Giovanni (the illegitimate son of Costanzo I of Pesaro). This alliance failed as the Borgia annulled the marriage once the Sforza's were no longer needed. In 1499, in the course of the Italian Wars, the army of Louis XII of France took Milan from Ludovico Sforza (known as Ludovico il Moro, famous for taking Leonardo da Vinci into his service). After Imperial German troops drove out the French, Maximilian Sforza, son of Ludovico, became Duke of Milan (1512-1515) until the French returned under Francis I of France and imprisoned him. One of the cursed artifacts from Friday the 13th: The Series was the "Sforza Glove", attributed to the original family's possession. Thomas Harris's character Hannibal Lecter is a descendant of the House of Sforza. In the anime, manga and book series Trinity Blood, one of the Cardinals and Duchess of Milan is named Caterina Sforza. Caterina Sforza appears as a non-playable character in the video game Assassin's Creed 2 and its sequel, Assassin's Creed: Brotherhood. The Sforza figure prominently in the Showtime series on the Borgia family. The house is mentioned in a song about the Borgia Family in the British edutainment TV show Horrible Histories. Wikimedia Commons has media related to House of Sforza. ↑ "La Signoria degli Sforza". Gradara.com. Retrieved 2013-04-23.